Your Grace is Sufficient: Death, where is your sting? Just a week into my last parish posting, I was confronted by a distraught, grieving and very angry mother. Her son, a brilliant scholar, had been killed in a road accident. She didn’t know what to make of it. She was not only confused, she was angry with God. She said to me: “Why has God done this to me? Why did He take my son away?” Convinced that God had let her down, she was now on the verge of giving up on Him. In the face of the most implacable, inexorable enemy of human race, I was lost for words. Who could blame her for her anger? Many have found themselves in a similar situation, encountered death in the family or among friends, and will be equally unable to cope or even begin to understand how there is any justice or wisdom in the sudden and violent demise of their loved one. If that was the case, why then does death exist? A possible answer is, “they had it coming.” They are being punished. But what happens if the person seems innocent and good. Why would death not discriminate between the good and the bad, the old and the young? It is when death chooses the good and the young that we cry foul. One common and simplistic answer is that we are victims of forces beyond our control. Since we have no control over our lives, we have no responsibility for our destiny. It’s all written in the stars. There is an inherent fatalism in this view, a view that is firmly rejected by Scriptures. But perhaps more destructive and sinister is to attribute death not to blind fate but to the deliberate will of God. When there is no longer anyone else to blame, it is easy to lay the blame at God’s feet. The silence of God would be his indictment. But scripture rejects both fatalism and placing the blame with God. No, death didn’t just happened. Nor is it God's will. Death is the result of sin. At the end of today’s first reading, we read that “it was the devil’s envy that brought death into the world.” It is the final victory of the devil, the result of his destructive activity. If man had not sinned, he would not have died. His body may have changed and evolved over great periods of time, but it would not have been separated from his spirit to return to the dust, and man’s soul itself would not have been corrupted, losing power over its body and becoming its slave. This is the meaning of the sin of Adam, made in God’s image and inspired with His Spirit, and has chosen death instead of life, evil instead of righteousness, and so through defilement of his nature in rebellion against God, brought corruption and death to the world. The gospel reading therefore provides insight into this Truth that God stands for life and not death. It is made up of two tales, one of the healing of a woman who suffered from haemorrhage, and the other, the raising of a dead girl. Without having to state the obvious, the woman with the haemorrhage and the young girl eventually both died, as we all will. This did not mean that Jesus had failed or merely postponed the inevitable. His healing of the woman and his raising of the child are signs of the Kingdom of God. As signs, they point to the kingdom’s ultimate plan, which is for union with God. 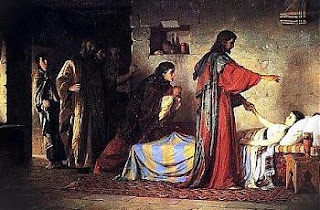 These miracles told the people of Jesus’ time, and us, that God walks with us in our suffering with great love and tenderness, and promises that our mortality is not the end of the story. For God is the God of life. The righteous are not destined for death but for an eternal and immortal existence. There is no denying that death is real, and that it presents a source of pain in the here-and-now. But as Christians, we must remember that death is not “part of God’s plan,” so to speak. It is contrary to everything God is about. As strong as death may appear to be, as sudden and as tragic as it may seem to be, death does not have dominion, it does not have the final word. We are reminded that death is not the end of our story as the people of God. It’s often said “death is only natural.” This is entirely inaccurate. Death is un-natural, which is why we find it so shocking and painful. We were created for imperishability, for incorruption, intended for a life without end. We were created to be with God in Paradise forever. Through, his Passion, Death and Resurrection, Christ has revealed to us a very different ending, an ending that does not conclude with death as its final chapter. He shows us the resurrection, the peace of immortality that awaits the righteous faithful in Christ. He shows us what God does for his friends. As we grow older, frailer, and weaker, the nearness and reality of death will seem every more apparent to us. This is why we must never take our eyes off Christ and neither should we doubt the victory he has over death, if not we will fall victim to despair. The Book of Wisdom reassures us that our brothers and sisters are not forgotten or forsaken by God. Their departure is not a true affliction, nor is it destruction. Wisdom announces that the death of God’s faithful is only a prelude to being held by God until the time of resurrection, when we will live with God in the manner God originally intended. One of my favourite quotes come from St Baldwin of Canterbury who went bravely to his death in the Crusades. His words ring true today and for all ages. Yes, Death is Strong! But it is no match to the Love of God. And that is our hope and our salvation!